I’m not a horror fan at all but I do enjoy Henry James, so when this book was suggested as a Halloween read for a book group I was okay with a re-read. I really got a whole lot more out of it this time – very much enjoyed it. James sets up the story in true ghost story fashion. The frame: long ago and late at night in a big old house around a flickering fireplace a group of people meet. The first person here relates how another guest, Douglas, tells of a story he knows but will continue on another night. The next time they meet he brings a letter (or diary or something) from a woman long ago (again) which he has in his possession. The woman is now dead. This woman, never named, was hired by a strange man to live with and tend to the needs of two orphan children in his care. She is to do whatever she needs to do except contact him – about anything. She makes friends with the head housekeeper, Mrs. Grose, who tells her some past history about the prior governess (now deceased) and a hired hand (also deceased). Almost right away it becomes apparent there is something very wrong in the house. The children are really too good to be true although the older child, Miles, about age 12 I would guess, was expelled from his school for unspecified reasons. And then some rather spooky stuff starts happening. Are the children really seeing in contact with the ghosts of their prior tutor and the hired hand? Is the current governess a reliable narrator or is she going a bit batty? The language is really old fashioned – more so than James’ usual novels. That must be to add about 60 years to the story – 60 years prior to 1898 when it was published. In that way (but only in that way) might it be considered historical fiction. 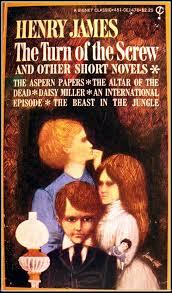 The ambiguity of who is spooked and in what way is what makes this a rather literary rather than general scary story. There are more ambiguities than those and conclusions of various sorts are supported by allusions to gothic literature. Jane Eyre and The Mysteries of Udolpho. I suppose it could even be considered horror or at least occult. That said, it is a very good story for Halloween.